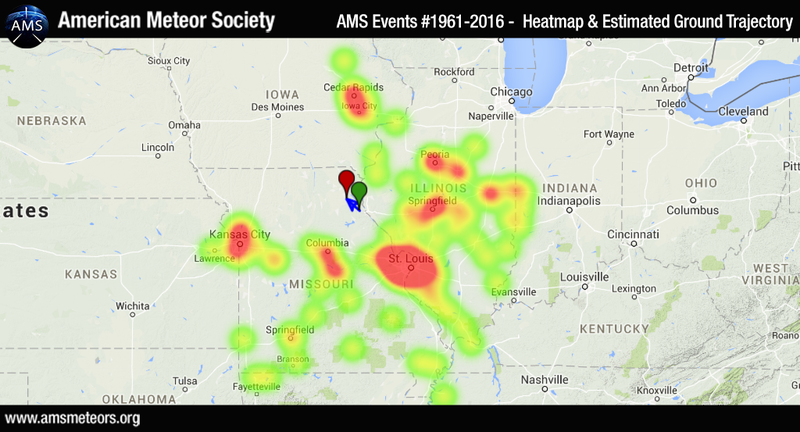 The AMS has received nearly 390 reports so far of a rare daylight fireball event over the Midwestern states of Missouri, Illinois, Iowa, Kansas, Tennessee, Kentucky, and Indiana on Monday June 6th 2016 around 11:41am CDT (16:41 UT). The preliminary trajectory seems to have placed this event over northeastern Missouri. 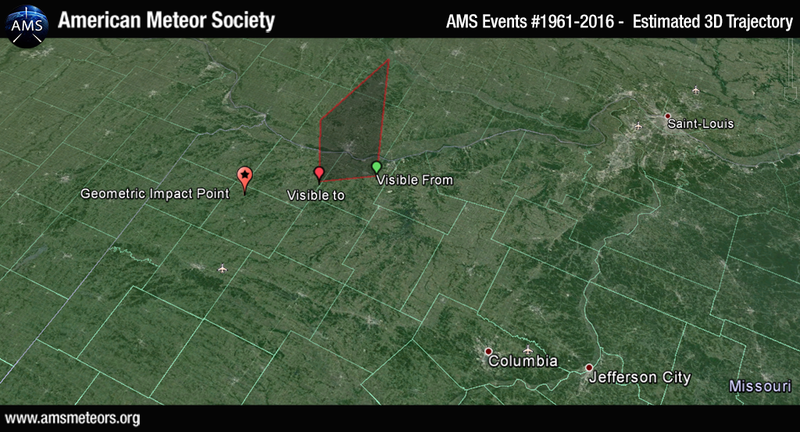 The first estimated 3D trajectory below shows that the fireball mainly flew over Marion County and Lewis County, MO. I was one mile south of Buffalo, Mo., headed north on Highway 65 when my wife and I saw a fiery red and green object falling downward from an easterly to a westerly direction at a one o’clock position in the sky. This occurred about 11:45 a.m on Monday, June 6, 2016, and lasted for just a few seconds. It was very bright considering that the occurrence was near midday with clear, sunny weather. I would compare its brightness to the arc of a welder. I was in Decatur Illinois driving west and observes this!! It looked like it was only blocks away it was so bright. Talked to my daughter 40 miles west of me just a couple minutes after that and discovered she saw it too!! We were both So excited we saw it together but in two different locations. Amazing sight Best in my life! 65 yrs old!!! Steady white dot moving across northern Kentucky sky around this time, thought it might be a satellite at an unusual angle for reflection in mid day. Slightly too fast for plane, however no fire ball and/or plume seen, disappeared on horizon. I was in MD driving E on 197 towards Bowie and saw a Fireball around 8:40pm shoot across the sky and break apart into 4 pieces. I was facing south in Frytown/Kalona, IA @ 11:42am. Clear skies, a bright flash exploded in the sky. Reports that it entered in NE Missouri sound right, though it looked closer based on the brightness. My folks raised me to notice things and I’ve seen a lot of “shooting stars,” but this was my first daytime experience and definitely the closest/brightest/largest. I. was just south of Xenia, Illinois heading West. Looked like a sparkler or flare going straight down. Fireball that went over Saint Louis 06/06 landed in a field next to I-74EB around mile marker 205 – 210. I was traveling WB on I-74 at 11:40 – 11:45 AM and could not believe my eyes! Saw the flame out and everything!! I did not witness the daylight meteor on june 6th, but witnessed an evening fireball on june 4th around 9:30pm over the western skies that streaked across the entire sky and disappeared over the southwestern horizon. I live in western st. louis. It looked like a green firework at the time in the northwest direction when i first spotted it. I was driving at the time and did not have my camera with me at the time. I am still surprised it didnt get reported that evening. I was traveling west on Hwy 40 near the Lee’s Summit, Missouri airport when I saw a meteor in the west by northwest sky. There was a white trail with a blue-green hue in the leading edge. This was June 6, 2016 at 11:40 AM. That should have been east bound and east by northeast. I flunked geography. Video and reports indicate a meteoroid might have reached the ground. Are there any reports of anyone finding a rock on the ground? Charles, there have not been any reports of meteorites being found from this object. Not too surprising no meteorites have been officially reported from this event. First of all, it’s difficult to narrow down a fall area. And if the meteorite weighs only a few ounces up to about a pound and falls in a wooded area or into a weedy meadow or cropland with soft soil–good luck to all of us searching for the space rock! Too bad a meteorite didn’t hit someone’s house–without injuring anyone of course. Much easier to find a rock that does some minor roof damage.